The Crawford Family: Family Vacation!!! We just had the BEST TIME!!! Adam has been working SO hard lately! It was a great time to have a little getaway! 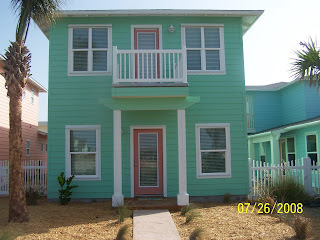 My wonderful parents have built a beautiful beach house in Port Aransas, Texas. For those of you who are unfamiliar with the area, it is a little island off of the Gulf Coast of Texas. It has always been a special place to Adam and me, since long before we were married, so it is such a blessing to have a place where we can go for vacations. The house was just recently finished, so this was our first time to go together. It is all "beached" out, SO CUTE! And it is kiwi green with salmon colored doors! How many times in your life do you get to have a kiwi green house? It was so great to spend time with my little family! We played, and played, and played! 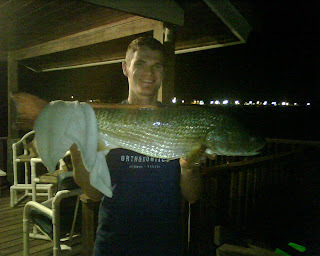 Adam caught a TON of fish, but one REALLY BIG ONE!!! He's so cute with his fish! He did such a great job of cleaning it and filleting it, he is such a MAN!!! So, we took it to one of our favorite restaurants on the island, Fins, and they cooked it up for us! It was DELICIOUS!!! I am so thankful that God has blessed me with a husband that is my best friend! We have so much fun just being together, no plans, no agenda, just together. There is nothing better! And our little girl is just a pure joy! I am so thankful for my precious family! And, I can't wait until Jett is here to come along with us! Thanks Mom and Dad for providing a place for your kiddos to have SO MUCH FUN!!! Here is one last picture of a beautiful sunset off the dock! What a creative God we serve! So many things to comment on! First off, LOVE the getaway house, it is adorable! Ha!! Looks like the perfect get-away place where you can leave the stresses of life behind! Secondly, Ms. Addie is getting so tall, looking like big sister more and more. She is such a cutie!!!! Oh, and you look adorable, at least squatting down beside her...I could kind of see your little baby bump, so precious! Lastly, congrats to Adam for getting his braces off! I know he is thrilled. Great pics! Taber! Do you remember our FUN Spring Break trip to Port Aransas!? What fun! Glad to see you guys doing so well! How much fun. That house is adorbale and it looked like you had a blast. Oh...and Addie looks really cute in Malia's swimsuit! I LOVE HIS TEETH!!! WE'RE ALL DONE! It looks like ya'll had a great time! HURRY UP JETT - I'M READY TO MEET YOU!